Wednesdays got a whole lot better! Do you bring the grandkids to Jump every now and then? Looking for something to do with them when you’ve got them one Wednesday afternoon? Leeds, due to your parks later opening times this offer is available 3pm – 5pm. 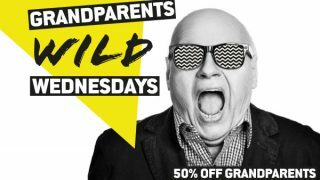 This is a walk in offer, so all you have to do is turn up and quote “Grandparents Wild Wednesdays” at reception. Please note, this offer isn’t available on our toddler sessions. Read below for full list of T&Cs. 50% off every Wednesday on Open Jump. Between 12pm and 5pm Sheffield & Rotherham. Between 3pm - 5pm Leeds. 50% off full booking for a grandparent (or grandparents) and 2 grandchildren. If the grandparents don’t want to go on the park they can get 50% off the two grandchildren’s jumps. Based on walk in price. One hour bounce only. Not to be used in conjunction with the unlimited bounce offer. Last admission for this offer 4pm. Discount for two grandchildren max.